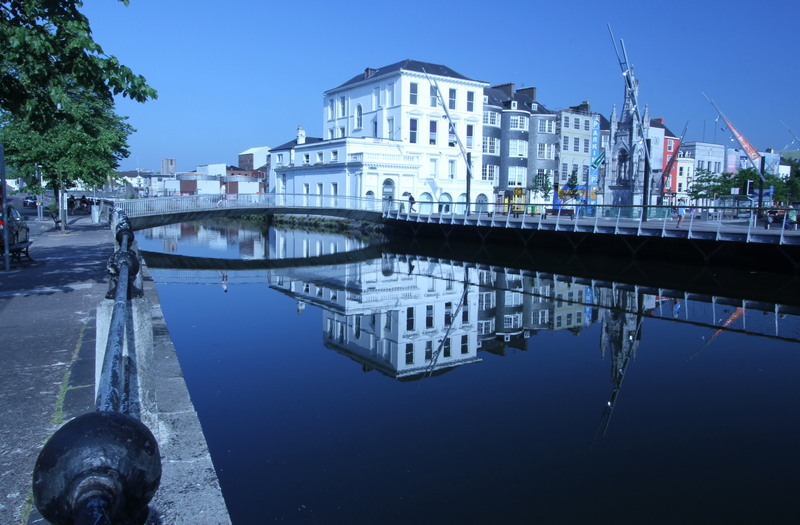 The following photos were taken on the same morning as ‘Cork Blues‘ and ‘Lee-side Walk‘ in what proved to be a very blue morning in Cork City. 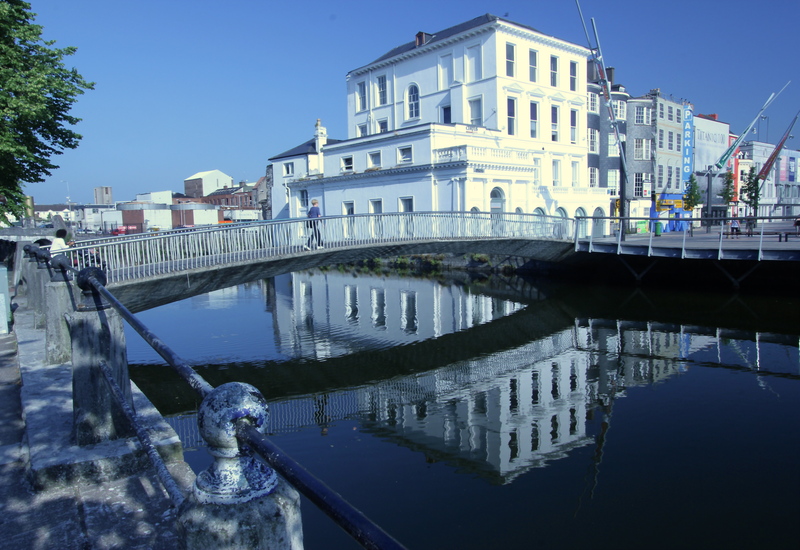 The first two shots feature the pedestrian bridge over the River Lee to Grand Parade (that was pictured in Lee Side walk). At the back of these shots you can see the concrete tower on the old brewery site. 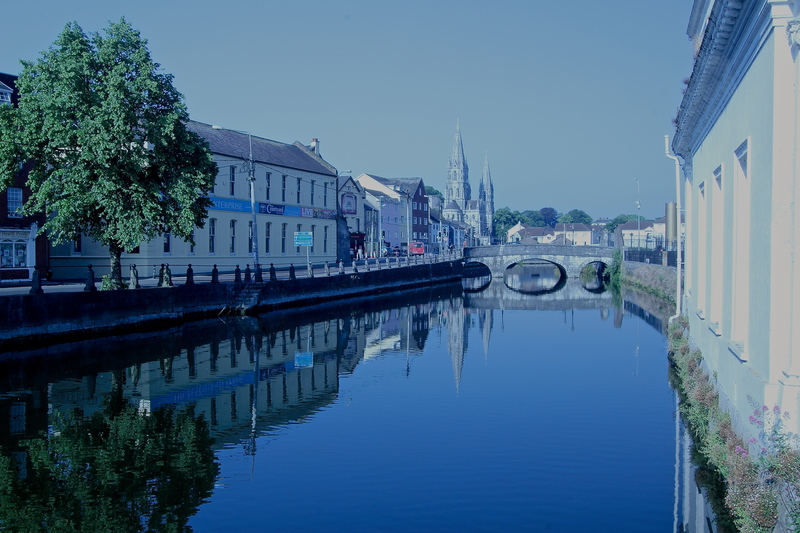 The final shot is taken on the road bridge by the decaying Beamish & Crawford brewery and features St Finbarr’s Cathedral, Cork. Hmmm, all that blue and just a green tree here and there. What would the leprechauns think? Phew. . . I was worried they might have baled ! I will never forget seeing shades of green I had never seen before and never imagine possible! Drinking too much Guinness the night before, huh ? I stand corrected. Same affect I imagine. . . .
MM – what time of the morning were these shots taken? It seems you had the beauty all to yourself. Beautiful blue, and calmness, everywhere. He is doing very well, Tuesday is his LAST post-op check up at the VA.
Beautiful blue reflections, cities with rivers flowing through the centre are always so pretty. Lovely compositions in your photos. Beautiful reflections in the water, MM. first time to your blog and I love your photos. you are most welcome! I enjoyed looking at your photos. have not been to cork.